All patients are treated with dignity, respect at all times and privacy when it is needed. Providing multi-disciplinary team of senior nurses and paramedics to avoid unnecessary Emergency Admissions and A&E attendances of patients in their own homes including Care Homes. Teams include nursing (and assistance) with involvement of Pharmacy as deemed appropriate to cover the services. Patients2People includes clinical telephone advice and developments in Telemedicine and Telehealth. 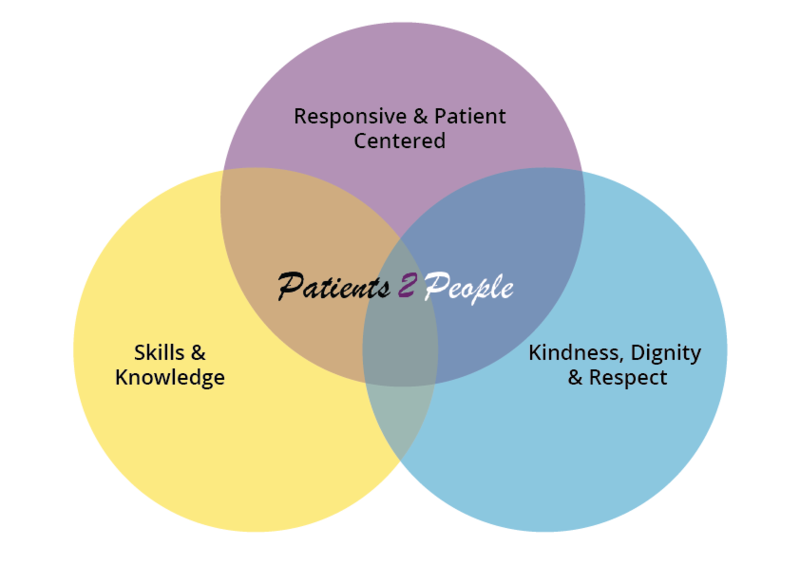 Patients2People is a quality driven, patient focused, cost effective service, delivered in a timely and appropriate manner against a set of given standards. Patients2People are committed to maintaining a highly skilled workforce utilising current technology to deliver high quality results that are accurate, within an appropriate time and that are properly interpreted. All staff are clinically supervised by the Clinical Directors of Patients2People (senior nurse and paramedic). All staff are trained specifically in infection prevention & control, safeguarding and information governance in addition to their clinical training. All staff are DBS and Health check screened and Checked against the Fit and Proper Person Policy. The service complies with The Fundamental Standards of Quality (CQC) and the National Quality Standards for Out of Hours Primary Care regarding access, audit and patient satisfaction. Patients2People provide a weekly and monthly report regarding activity and performance against the National OOhrs standards, complaints, compliments, incidents, interventions and referral rates. Record keeping is via Advanced Healthcare iNurse or community packaged linked into a hosted Adastra server linking through N3 connections to NHS.net email and GP DTS messaging. Using old fashioned family support network approach and complying with CQC fundamental standards. deliver high quality reports which are accurate and that are properly interpreted.